I have talked about this before, but I am still loving circle skirts! They are so easy to make. I made a couple for my friend several months ago and they take no time at all! I am planning on making some for myself this fall. I can't wait. I came across this tutorial the other day at icandy handmade. The jersey fabric she uses looks so comfortable! 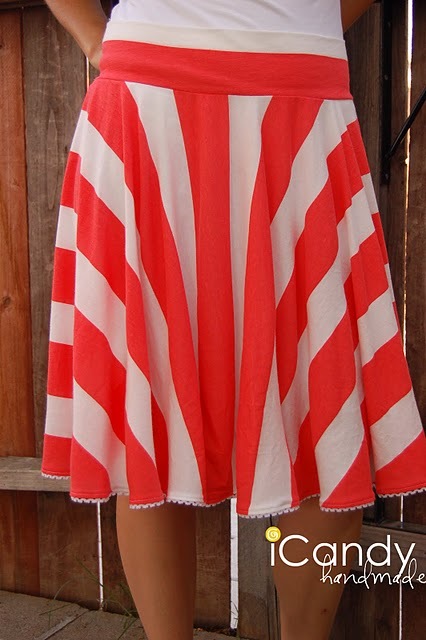 I love the stripes and most of all, I love the little trim detail at the bottom. I'm about to go searching for some fun jersey fabric right now!